Best Breakfasts in Hong Kong: Where Art Thou? Hong Kong is known for its abundance of choices when it comes to restaurants and picking a good breakfast place can be a daunting task sometimes. 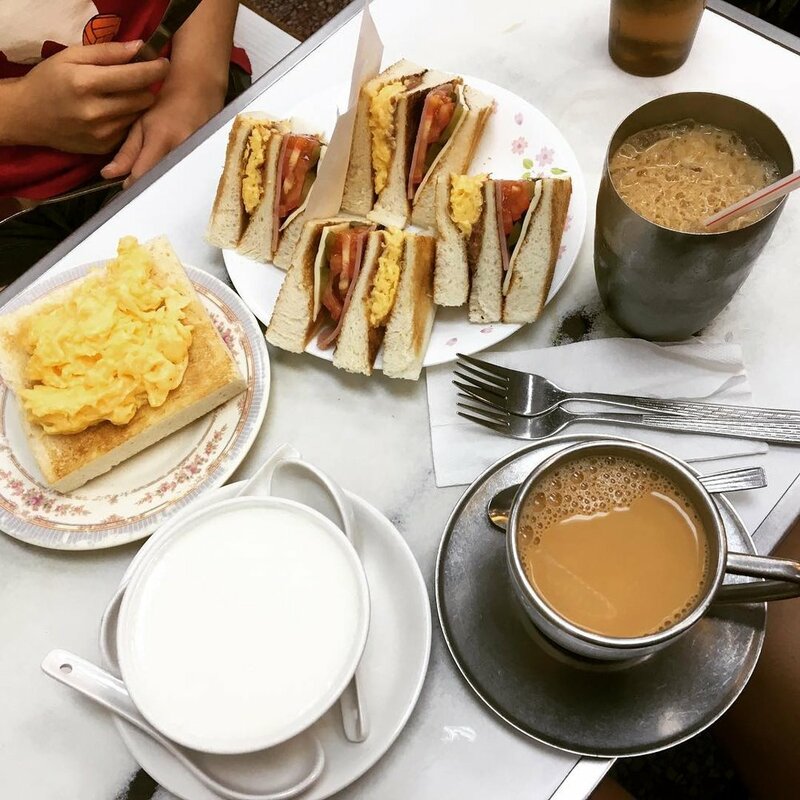 Whether you're traveling in Hong Kong for the first time or coming back for another visit because you just can't get enough, take notes of our favourite brekkie spots in town so you can start off your days all bright and shine. This outdoor food stall (also known as dai pai dong) serves one of the best and most unique breakfasts on/in Hong Kong Island. We love their toasted sandwiches and our favorite is the spiced pork dice, scrambled egg and melted cheese combo. What makes this sandwich addictive is the layer of peanut butter and shredded cabbage, which adds another layer of flavor and texture. Another option is corned beef, though we find it lacks the kick in the spiced pork version. Known for being meticulous, the chef at Yue Hing makes only one dish at a time to ensure customers can enjoy their sandwich all crispy and hot. These sandwiches get sold out quick and early though, so we highly recommend to grab a seat there around 9am/9:30 am. If you're looking to try some traditional Hong Kong breakfast fares, Nathan Congee and Noodles serves up classic dishes such as congee, yau ja gwai (Chinese fried dough stick) and noodles. While this little casual eatery might be small and old, they serve the best chicken congee in town, and it's a dish that we always order. The chicken is juicy and tender, and you can smell its fragrance upon taking a bite. The aroma comes from the Chinese wine used to marinate the meat. Order a side of yau ja gwai, a savory donut stick that accompanies to congee. Dip them in and have them just warm for an extra crunch. Other best-seller dishes include pig liver and fish congee and century egg served with a side of ginger. There's also an assortment of noodles as well. Like many old-school restaurants, Nathan also has a handwritten menu all over the walls, mostly in Chinese but also in Thai as there are quite a lot of tourists visiting from Thailand. English menu is also available! Eating at Australian Dairy Company is an experience on its own. It's known for its "get in and get out" attitude. The staff is rude, and service is basically non-existent in the realm of Australia Dairy Company. However, the food does shine. The scrambled egg is the king at ADC, and you can see everyone eating it at every. single. table. Another you-really-shouldn't-miss-it dish is the steamed milk pudding with egg white, a classic comfort dessert in Hong Kong. It's great for those who want a little bit of sugary kick in the morning! There's always a queue outside and don't be intimidated/have the impression that you'll have to wait long, as the restaurant asks customers to leave as soon as they finish eating. According to our friend at Will Travel For Food, she was in and out within 15 minutes! As much as we love Chinese breakfast, all we want sometimes is a good, hearty diner style breakfast. And The Flying Pan delivers exactly that. The two locations in Central and Wan Chai are open 24/7 and can cure any homesickness and hangovers. Lots of egg-dishes including the typical egg, sausage, bacon breakfast combo, egg benedicts, frittatas, and omelets. Oh, and they served classic pancakes with golden syrups too! Tucked away on the 1/F at Sheung Wan Municipal Services Building, Shui Kee is a cha chaan teng that's been serving classic comfort food for more than half a decade. Their signature Hong Kong-style French toast isn't as heavy as the typical deep fried ones. Using the very first HK Style Toast generation method, the owner dips the bread in egg batter before pan frying both sides till crisp. The golden toast is topped with drizzles of condensed milk. We love how it's lighter to the typical HK style toast and its fluffy texture. Don't forget to order Hong Kong milk tea on the side. While the iced version isn't as creamy and rich as the hot one, it's served in a classic soft drink bottle (with no labels), so it might be worth for an Instagram shot. Opening Hours: 8:00 am - 6:00 pm, Monday to Saturday. Closed on Sundays. Last but not least, we know it's quite hard to find truly gluten-free and vegan food in Hong Kong. Grassroots Pantry is a leading force in the local community and promotes healthy eating without sacrificing the taste. Located on Hollywood Road, the restaurant has an incredibly high ceiling (which is quite rare in Hong Kong), and the airy space has a mix of rustic and industrial vibes with its mismatched chairs, neutral tones and plenty of hanging plants. Smoked carrot crepes, lemon chia seeds pancakes and carrot walnut french toasts are some of the owner's favorites.